3.www.suny.edu – ONLY IF THE SPECIFIC SUNY SCHOOL DOES NOT ACCEPT THE COMMON APP. Bring a 9x12 manila envelope addressed to each individual SUNY college Undergraduate Admissions office to which you are applying with 4 stamps. Include the SUNY School Counselor Form (which will be copied by your counselor for each SUNY campus you apply). 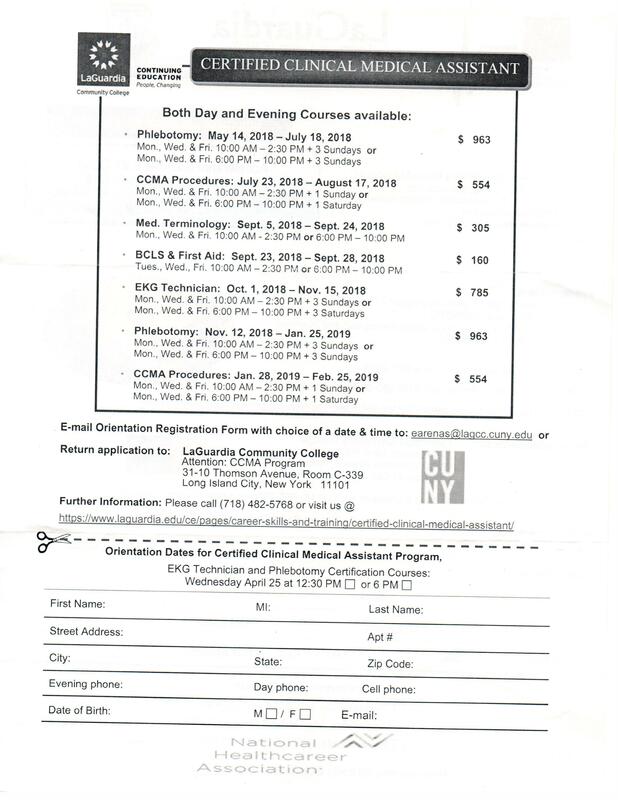 BLUE Transcript Request Form – one for all SUNY schools. $5 for an official transcript for each school. One BLUE Transcript Request Form for each school $5 for an official transcript for each school. 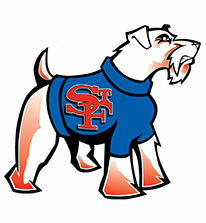 St. Francis Prep will host several Onsite Admission opportunities for our students. Notices will be posted outside the college office making them aware of date of Onsite and specific directions for each Onsite. 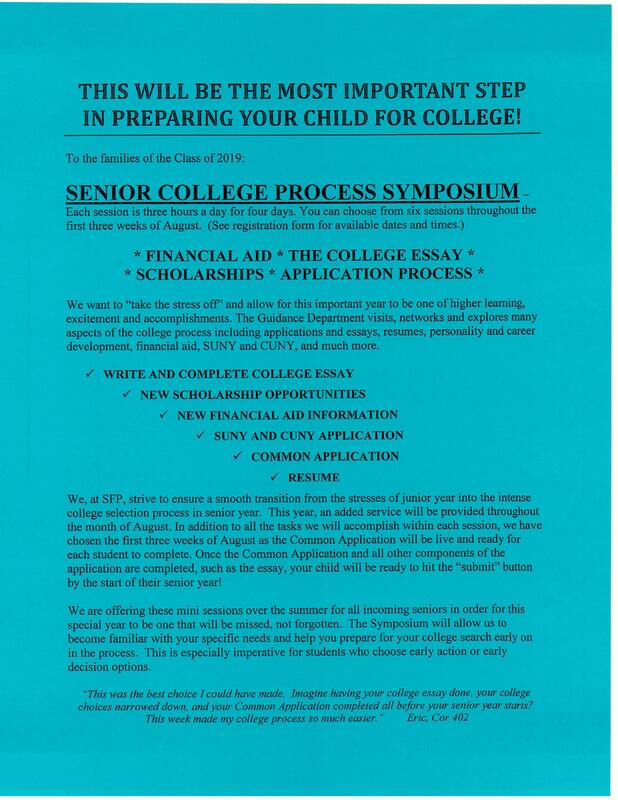 College admissions representatives will come to Prep where they will hold a personal interview with students, review their applications and in most cases, render a decision at that time. Each student will receive an appointment card in their Cor box the day before the Onsite. Completed application (follow College Office directions on how to obtain application). Students must meet individual college requirements. Completed BLUE Transcript Request Form. Copies of official SAT or ACT scores. * Make a list of the colleges in which you are interested. * Log onto these college websites to gather some important information: majors offered, programs available, location, cost, a general profile of GPA and SAT scores of admitted students, application deadlines, if SAT II tests are required, etc. * Most college applications require an essay. Check websites to see if topics are given. If not, a personal statement is accepted by many schools. This can include a personal experience that has been an influence in your life. The summer is a perfect time to begin to write rough drafts so that you have a head start on the process. Seniors: When you return to school in September, you can ask an English teacher to review the essay, or visit the writing center for help(appointments available through the English Department). Do this early, as they will get many requests, and you need to be respectful of their time. * Visit Colleges. Fall and Spring are good times to attend "open house" at colleges. Most colleges will give tours during the summer, and even speak with students and parents. It will give you some idea of the campus and facilities, traveling time, surrounding environment, etc. * SAT: JUNIOR STUDENTS TAKE the SAT in the spring. Once you receive those scores we suggest spending time over the summer preparing for the fall SAT. Focus on the area(s) where your performance was weak. SENIOR STUDENTS WILL TAKE THE SAT (again) IN THE FALL. *SENIORS: It is very strongly suggested that you register on-line for the October or November SAT exam during the summer approaching senior year. speak informally the veterinarians and admissions representatives. WILL BE VISITING OUR SCHOOL!!! All INTERESTED Please Sign up in the College Office. February 16 is the perfect time to visit for an Open House. It’s not too late to register! Tour the campus and arts studios, meet with VCUarts faculty and students, attend sessions with arts departments, the Honors College, Financial Aid, study abroad, and more. You can take a VCUarts tour Monday-Friday at 1 PM. This exciting program is an introduction to diversity and cultural life on GW's campus and is open to all students with a commitment to multiculturalism, equality, and social justice. This event allows prospective high school juniors to discuss academic and financial aid options with current students and explore the diversity and cultural opportunities of our community. Save the date now for this coming spring! TIME 2000 (Teaching Improvements through Mathematics Education) is a four-year secondary mathematics teacher preparation program offering scholarships towards tuition. * Participants are part of a close-knit learning community in which they take their mathematics and education courses together, engage in study groups, and attend seminars, conferences, and off-campus events. Close guidance and support are provided by carefully selected faculty who teach in the program. Students in this program double major in mathematics and secondary education. Upon graduation and completion of New York State examinations, students are fully qualified to begin teaching mathematics in grades 7 through 12. Congratulations! 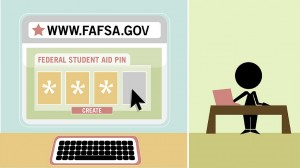 You finished filling out the 2014-2015 Free Application for Federal Student Aid (FAFSA)! Now what? Residence: Must reside within the boundaries of the 3rd Congressional District of New York. Minimum of three letters of recommendation from (a) an academic teacher; (b) a supervisor-coach, employer, guidance counselor, scout leader, etc. ; and (c) an acquaintance-someone who knows the applicant but is not a member of the applicant's family. Please contact Edward G. Aulman, Veterans Caseworker, at the Huntington Office, (631) 923-4104. · “My test scores are above average, but I didn’t do as well on the SAT/ACT as I personally would have liked. “This student should submit his/her test scores. · “Standardized testing has always been a weakness of mine. My grades and curriculum are rigorous and competitive, but my SAT/ACT scores are below the schools mid-range.” This student should not submit his/her test scores. · “I don’t want to pay or can’t afford to send my test scores.” Scores can be sent using a ton of free options. This student should submit his/her test scores. · “Sending my test scores is an obstacle and will take way too long.” This student should submit his/her test scores. · “My best scores are way below Hofstra’s published average and mid-range scores. “ (SAT scores 1140 to 1330, with an average ACT equivalent of 24 to 31.) This student should not submit his/her test scores. The Office of Undergraduate Admissions at Binghamton University now permits applicants to self-report their SAT and ACT test scores. This decision reflects our commitment as a public university to remove barriers to the college application process. Students should have their full score report with them, including all section scores, when self-reporting their test scores. They will require official reports sent by the testing agency if the student chooses to enroll. Visit the test policy webpage for complete details and answers to frequently asked questions. Note: The option to self-report scores is not available for international or athlete applicants. The guide covers all aspects of HSI’s from what the designation means, to how it gets implemented at colleges. Interested in seeing the School of Architecture in action? Come visit us during final reviews! Final reviews are a culmination of our students' studio work for the semester, and show off their research and design. You can find more details here. Are you a high school sophomore or junior curious about the field of architecture and design? Do you want to learn how to engage the past and shape the future? Through interactive design exercises and a tour of Cooper Carry, students will learn about all scales of the built environment including its history, planning and design from University of Virginia School of Architecture Alumni. 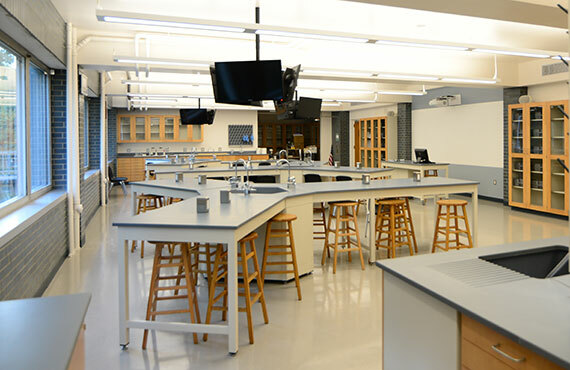 CSI is the only college of Staten Island, the second institution within the City University of New York (CUNY) and one of only a few in the greater metropolitan area offering an ABET-accredited Bachelor's and Master's in Electrical Engineering (BSEE and MEEE). BSEE and MEEE Programs in the High-Tech Field of Electrical Engineering—historically exhibiting steady growth and the breeding ground for modern advances in telecommunications, automation, and networking among other technologies. BS Degree in Engineering Science with specializations in Mechanical Engineering and Computer Engineering—a modern, practical approach to engineering education. 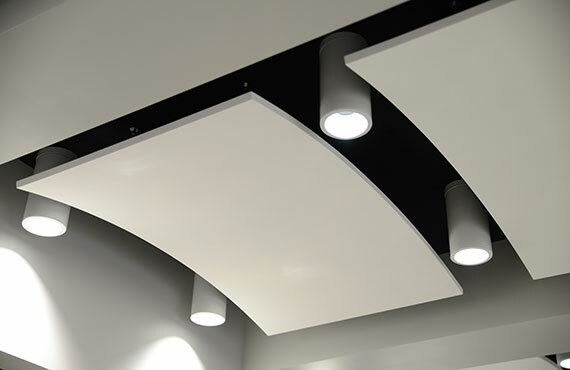 A broad engineering, mathematical and scientific background permits flexibility and adjustment to the rapidly changing techniques of contemporary engineering. 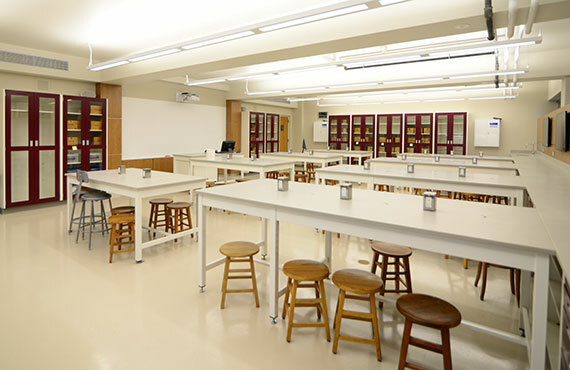 New, high-tech equipped laboratories. NYS License-Preparatory BS in Earth and Environmental Science. As the world's population increases, earth and environmental scientists are in growing demand, with earth and environmental sciences predicted to be among the fastest-growing fields, according to both federal and New York State long-term occupational projections.